Before SEO, there was public relations. After SEO, there will be public relations. SEO — the widely used acronym for search engine optimization — is a digital marketing strategy that started getting traction in the late ’90s and quickly grew into a buzzword industry. Basically, SEO is the process of earning better visibility in organic search results from a search engine like Google. When was the last time you clicked beyond the first page of your search results? That’s what SEO is all about. Your organization can’t always be the first link on the list, but you do want to be there when users search for keywords about your organization. Take the website for Canary Promotion. 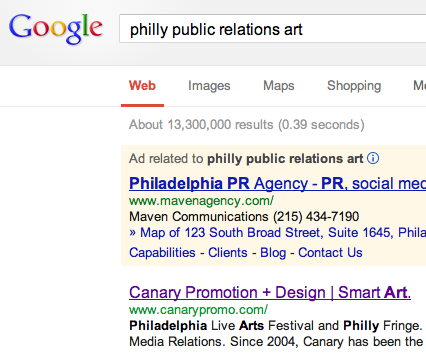 If you search for “Philly public relations art,” Canary is the first organic result — and likely the first link you’ll click. Optimizing your rank for top keywords used to mean taking advantage of everything search engines consider in determining search engine results pages. (SEO software provider SEOmoz gives an overview that lists ranking factors like anchor text from external links, external link popularity, and diversity of link sources.) But nowadays, it’s not so formulaic. 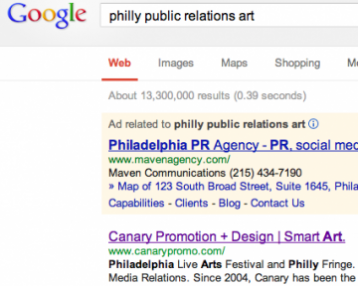 Public relations paid attention to SEO, and why not? It’s important to be found online, and PR outreach and SEO work together to make that happen: We optimize our press releases, and focus on personal pitching to targeted reporters instead of using newswire distribution alone. But the first step to great links is making relationships and reaching out to the right people. Frank Strong, director of PRat Vocus, wrote a 2012 blog post that summarized it well: “SEOs pitch links and get requests for content, while PR pros pitch content and oftentimes get links.” Luckily, arts and culture organizations are brimming with such rich, engaging content — and that real content wins every time. Pitching content done well is what brings the kind of natural and long-term SEO results that search engines won’t turn around and penalize when they reconfigure their algorithm. Raising awareness of your arts organization in the community is what, in turn, will draw traffic and links for your site. Posting a press release on your website can be helpful. Getting that press release re-posted widely can be even more helpful. But the best SEO results happen when reporters and bloggers write about the news in the press release and publish it on their own website and social network accounts. Again, public relations is the effort behind earning authoritative SEO. Authoritative SEO is important because search engines give a better ranking to links when they are published from an authoritative domain, like online media websites. Content from highly authoritative sources is also more likely to be shared — and in turn, more sharing means more links. Social sharing and more links means better SEO. So a respected media outlet taking your content into their own hands works for SEO on both sides — the high-value link increases visibility on search engine result pages, and increases likely engagement with your audience. Canary Promotion earns our clients natural SEO results by producing quality content and driving traffic to that content from authoritative sources. But remember, just like public relations, SEO isn’t something you can get done once and be finished with — it is an ongoing process.